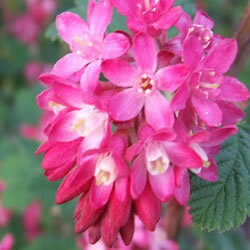 Flowering Currant. A compact, upright shrub with clusters of dark red flowers with a white centre in spring followed by blue-black fruit. Height: 3m. Spread: 2.5m. Deciduous. Hardy.